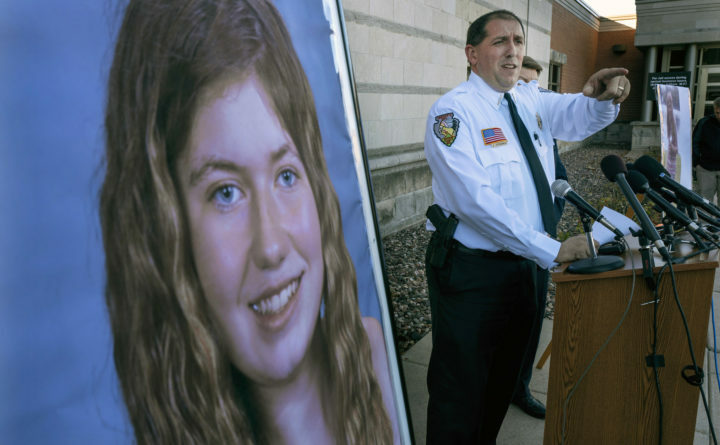 Barron County Sheriff Chris Fitzgerald speaks during a news conference in October about 13-year-old Jayme Closs, who has been missing since her parents were found dead in their home in Barron, Wisconsin. The northwest Wisconsin girl who went missing in October after her parents were killed has been found alive, authorities said Thursday, Jan. 10, 2019. During the 20 minutes Jayme was in their home, Kasinskas and her husband, Peter, tried to make her feel more comfortable, they said. They offered her water and food, but she declined both. Jayme was quiet, her emotions “pretty flat,” Peter Kasinskas said. Jayme told the couple she didn’t know where she was or anything about Gordon. From what she told them, they believed she was there for most of her disappearance. Gordon is about 40 miles south of Lake Superior and about 65 miles north of Barron, Jayme’s hometown. Gordon is home to about 645 people in a heavily forested region where logging is the top industry. The Douglas County Sheriff’s Office confirmed on its website that Jayme was found in the town at 4:43 p.m. Thursday, and that a suspect was taken into custody 11 minutes later. The Associated Press couldn’t confirm the Kasinskases’ account; the sheriff’s office’s non-emergency line rang unanswered Thursday night, and Sheriff Thomas Dalbec didn’t respond to an email.